RECOMMENDED INTAKE: Adults 50 years and over take one tablet a day with water. Taking more than the recommended daily intake may be harmful. This product contains vitamin A. Do not take if you are pregnant or likely to become pregnant, except on the advice of a doctor or antenatal clinic. This product contains Ginkgo & Ginseng. If you are under medical supervision consult your doctor before taking this product. 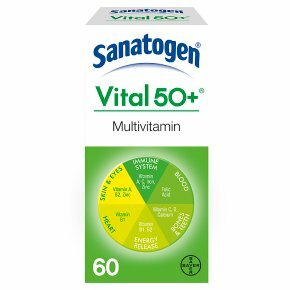 Sanatogen Vital 50+ should not replace a well balanced diet or a healthy lifestyle.